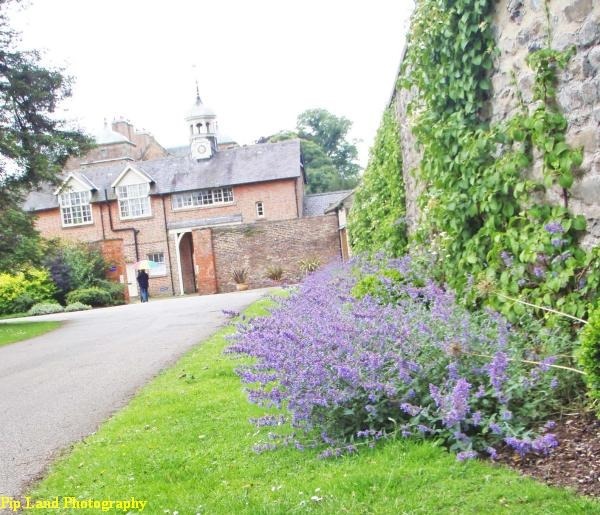 The cat mint bordering the route into Kiplin Hall was alive with bees. 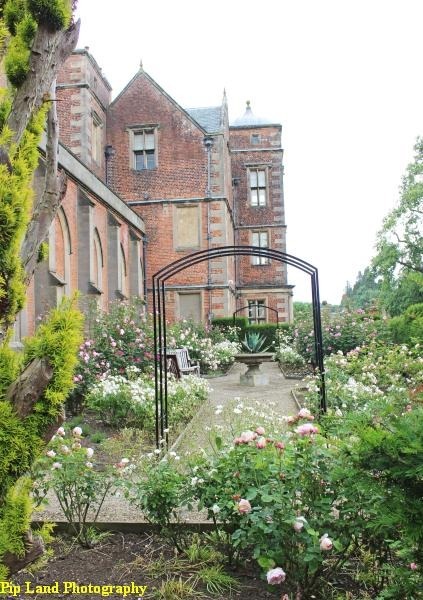 Below – the “back” view of Kiplin Hall. We had a thoroughly enjoyable and entertaining afternoon at Kiplin Hall near Bolton-on-Swale in North Yorkshire. This was not just because this Jacobean House was so interesting but also thanks to the great sense of humour displayed by so many of the volunteers on duty there. They definitely had a touch of “Last of Summer Wine” about them and we did have a good laugh. And thanks to the volunteers and staff the house still sparkles with the vitality of many of those who have lived there since the 1620s. We began our tour, of course, with coffee and a light lunch. Looking at the menu I thought I had to accept that I wouldn’t be able to eat anything given all my food intolerances. But the lady in charge of the catering came to my rescue and offered me an excellent green leaf and ham salad. The coffee was very good as well. Sitting by the window gazing out across what would have once been the grand entrance to Kiplin Hall all we had time to study the excellent guide book which helped us to make the most of our visit. Then it was off to the Drawing Room where, we were told, the families living there had sought to show off their best furniture. David was especially taken with the Chinese Chippendale cabinet which had been commissioned to house the delightful pietra dura (hard stone- marble and other coloured stones) scenes of the Italian countryside collected by Christopher Crowe Snr in the 18th century. Unlike me, David had been to Kiplin Hall before and he was very happy to visit, once again, his favourite room – the Library. A big vote of thanks to the last person to live at the hall, Bridget Talbot, who refused to have the Library demolished. Miss Talbot was one of those women I would have loved to have met. She was only 19-years-old when she joined the Belgian Refugee Committee in 1914 and a year later went to the Italian-Austrian front to help run canteens and provide first aid for wounded Italian soldiers and then for those from the British 7th Division. In the 1930s she invented a waterproof torch for the lifebelts of merchant seamen to improve their survival if they were lost overboard. This simple invention saved many Merchant Navy, Royal Navy and Royal Air Force personnel during the 2nd World War. During that war Kiplin Hall was first used as a recuperation centre for many men rescued from the beaches of Dunkirk. It was then requisitioned by the RAF and used as a maintenance unit. Flats were created on the 1st and 2nd floors for the officer and bombs were stored in the woods around the Hall. Kiplin Hall was almost derelict when the RAF moved out. From 1938 to 1958 Miss Talbot tried to interest the National Trust but the negotiations failed. One problem was that the National Trust wanted to return the Hall to its original Jacobean footprint. The room which became the library was added in the 1820s. It is a beautiful room, full of old books, and mementoes of a craftswoman – Beatrice Carpenter. She was the second wife of Admiral Walter C Carpenter who inherited the Hall in 1866. She not only created some exquisite pieces of inlay work as an exponent of the Arts and Crafts Movement but also shared her skills with local men at wood-carving classes at Bolton-on-Swale. David stopped to study the chair said to have been Lord Nelson’s in his cabin on the H.M.S. Victory while I wandered further into the library. Looking back I became fascinated by the two paintings of Venetian Courtesans by Bartolomeo Nazzari which Christopher Crowe Snr had acquired during his Grand Tour of Europe. Was the masked man the courtesan’s pimp, or one of her clients? And I couldn’t help wondering what had happened to her young child. How different to the painting of an elderly lady spinning, or to the 18th century stained glass panels showing New Testament scenes. It is an eclectic mix, just like the rest of the house – which just makes it that much more interesting. Upstairs there is a room retained just the way it was when used as an officer’s flat during the 2nd World War. And there is that startling bathroom with its Georgian fireplace, Victorian bath, 1950s’ plastic curtains and fading yellow 1970s’ wallpaper. Very different to the yellow wallpaper in the Travellers’ Bedroom with its ornate 18th century Italian bed and remarkable Japanese ship paintings. From the Long Gallery with its many paintings we could look down on the lovely lake created by gravel quarrying in the 1990s. That quarrying helped to save the hall for the funds from leasing the land went into a capital fund held by the Kiplin Hall charitable trust set up by Miss Talbot before she died in 1971. We were very impressed by the restoration work that has been carried out both inside the hall and outside in the gardens. It speaks volumes of the love and care of the staff and volunteers. And that can be felt in the pervasive happy atmosphere. We were fortunate to have passes issued to volunteers who help at the Dales Countryside Museum in Hawes. 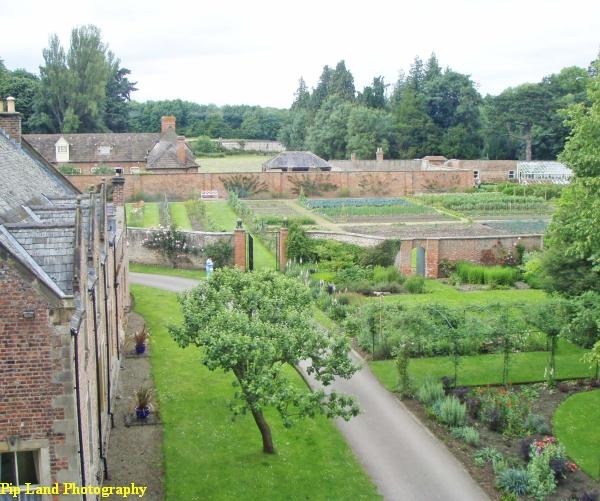 Below: the walled garden is now being restored as well as the flower gardens.